Think of a time when everything clicked in your life -- when you were the right person in the right place to fix something that went horribly wrong. Now think of a time when the situation was reversed -- when something went horribly wrong and you needed those pieces to fall into place. Almost exactly a year ago, that's how Matt Lickenbrock and Sean Ferguson met during a rainy night on the University of Dayton campus. Ferguson was walking across a parking lot when lightning zapped him, sending him into cardiac arrest. People gathered around, unsure of what to do when Lickenbrock happened upon them. 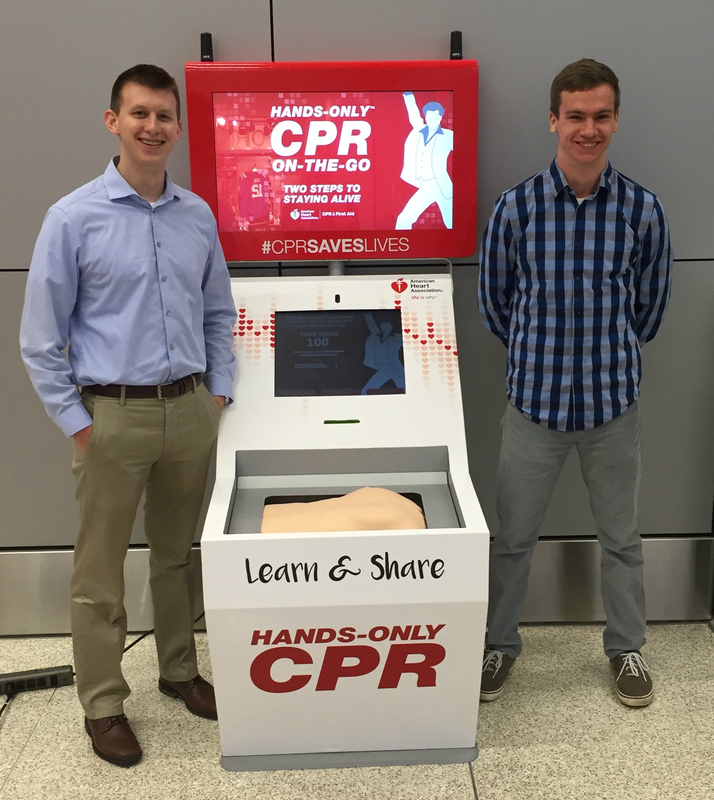 Just two days earlier, he'd learned CPR from a machine at an airport. As the son of two physicians, Lickenbrock jokes that he's "half-doctor, half-doctor." Medicine wasn't his calling, though. Engineering is, and he spent last year's spring semester off campus working at a physics research company. He still got a spring break, though, and spent it in Florida with his girlfriend. On the way back, during a layover at Dallas-Fort Worth International Airport, Lickenbrock saw a CPR-training kiosk and figured it would be a better use of his time than playing on his phone. He watched a training video, then took the test: giving chest compressions to a manikin. Lickenbrock's hands were in the right place and did a great job with his rhythm, done to the beat of the Bee Gees' classic "Stayin' Alive." But he failed because he didn't push hard enough. He passed on his second try but wasn't satisfied with a good-enough score. "If I'm going to learn it, I might as well get it right," he told himself. On his third try, he got a perfect score. Ferguson had two big things going on in his life: a difficult upper-level finance class and leading a Christian retreat for about 60 students. Problem was, the retreat was the upcoming weekend and a big test in his finance class was the day after. He decided to study Friday and catch up with the group Saturday. At 6:30 p.m. Wednesday, he broke that news to retreat directors. He headed home for dinner before telling everyone else at their usual 8 p.m. meeting. It was raining and Ferguson didn't have an umbrella, so he started jogging. When he reached the parking lot, he was halfway home. Because of his full-time job, Lickenbrock wasn't taking classes. But he'd been accepted into a summer engineering project in India and that required him to be on campus at 7:15 p.m. every Monday and Wednesday night. Lickenbrock usually walked. He drove this time because of the weather. On his way there, he saw a lightning bolt crash down. It turned the sky so bright he thought he saw it hit the building he was going to. Still, when he got to the parking lot and saw a person face-down on the ground, his first thought was that there'd been a car wreck. "Then I saw that his clothes were kind of charred and his skin smelled nasty, like something burning," Lickenbrock said. "At that point, I figured that big lightning bolt probably hit here." Lickenbrock also figured the guy was dead. Then someone said, "Do you know CPR?" With his airport lessons so fresh in his mind and muscle memory, Lickenbrock felt comfortable trying. "I tried to pretend this was the kiosk again," Lickenbrock said. "I was using that Bee Gees song to get the rhythm right. The biggest thing I learned was that I've got to push deep or it isn't going to do anything." After several minutes, help arrived. A nurse took over the compressions. Then came paramedics. As Ferguson was being taken to a hospital, Lickenbrock gave his name and phone number to police then went to class. Lickenbrock sat at his desk with his palms up, looking at hands that smelled of burning skin. His mind was swirling when a nearby student's phone buzzed with news: Somebody on campus got struck by lightning. Then Lickenbrock's phone buzzed. A police officer called to say the patient was in critical condition. Most importantly, that meant his heart was beating. "You basically saved this guy's life," the officer said. "His parents want to know who you are. Can we give them your contact information?" Of course, he said. And then he called his own parents, the Drs. Lickenbrock. "Hey, Mom and Dad," he said, "I think I just saved someone's life." The first thing Ferguson remembers is a nurse saying his beloved Pittsburgh Pirates lost three straight games to the Cincinnati Reds. "I let out a moan, like, `Noooooo!'" Ferguson said, laughing. "I always joke that Pittsburgh sports brought me back to life, too." He discovered that he was wrapped in gauze. Learning he'd been hit by lightning was even tougher to comprehend. Then he learned the extent of the damage. After four days in a Dayton hospital, he was taken by helicopter to Pittsburgh. He underwent surgery to repair his jaw and skin grafts, and began the long, slow process of overcoming nerve trauma that affects his balance and motor control. He couldn't stand on his own and had to relearn how to walk. Yet Ferguson was discharged May 11. He was walking with only a cane by mid-June. By August, he was shooting baskets, "feeling like a normal 23-year-old again." Each milestone blew away expectations. "They're optimistic that I should get close to where I was before the accident," Ferguson said. "Whether it's 90, 95 or 100 percent, I'll take it. I'm happy to be alive and doing things, even if it's not at the same pace or ability. I credit God's grace for putting all these events in place." Ferguson retook that finance class over the summer. He graduated in December, drawing a tremendous ovation when he walked across the stage to claim his diploma. "I had the worst seat in the house -- you stole the show," the student who followed Ferguson told him. In January, Ferguson returned to Pittsburgh to continue his recovery and pursue his career in sales and marketing. As for Lickenbrock, he's due to graduate in December. Driving from Pittsburgh to Dayton this fall, Ferguson called Lickenbrock and invited him to lunch. "On my way to picking him up, I'm thinking, `What do I say to someone who saved my life?'" Ferguson said. Over burritos, each told his version of the story. Both were in awe. "I can't believe you're sitting here so healthy," Lickenbrock said. "I can't believe I'm here with the guy who saved my life," Ferguson said. 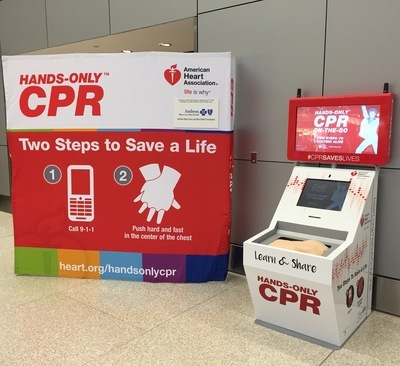 They connected a few more times, including at the recent unveiling of a CPR-training kiosk at the Indianapolis International Airport. A kiosk also recently opened in Chicago's O'Hare International Airport. Others are planned for Las Vegas' McCarran International Airport, Hartsfield-Jackson Atlanta International Airport and Baltimore-Washington International Airport, as well as The Global Center for Health Innovation in Cleveland and Anthem's office in Washington, D.C. All kiosks are provided by the American Heart Association and the Anthem Foundation, the philanthropic arm of Anthem, Inc.
Each year, more than 359,000 people suffer cardiac arrest outside of a hospital. Most people say they feel helpless to act because they don't know how to do CPR or learned long ago. The American Heart Association helped pioneer CPR over 50 years ago and continues to refine this technique. Even without formal training, anyone can be a lifesaver by remembering the steps to Hands-Only CPR -- call 911, then push hard and fast in the center of the chest, preferably to the beat of "Stayin' Alive," until help arrives. The next time you are traveling, look around for a kiosk to learn CPR or to get a refresher. "Even if you don't think you're ever going to need it," Lickenbrock said, "it's a really important skill to have."